The Green Belt Movement began with planting just seven trees. We learnt that while the power of the individual may be small, when numbers increase the impact can be huge. We believe that the 3Rs represented by MOTTAINAI BAMBOO (Reduce, Reuse, Recycle) will one day grow to a large circle. MOTTAINAI BAMBOO towels are made with a sense of respect. The drop or tear shaped spindle is a sign of the Mottainai spirit. This shape has a mysterious effect that changes perception depending on the viewer or feeling when viewed. However the Mottainai feeling we all have as we live our lives is very likely the same. This Japanese concept, inbred since ancient times, is shown in this motif with three different designs for the MOTTAINAI BAMBOO series. Turning the Mottainai spirit into a towel created a chic image. Be considerate in your daily life, to the people you meet, and to the natural environment. Do what you can each day with consideration in order to build a sustainable society. The blue, green and orange symbols add just a little color to this concept. The bright colors of 100% bamboo rayon pile represent Mottainai Bamboo. 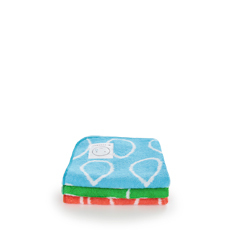 A towel that is absorbent, quick drying, light and convenient. 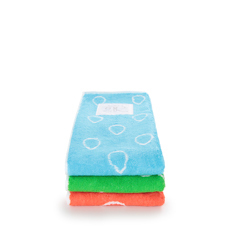 In between a bath towel and face towel, perfect for wiping your body after a workout. Depicting the 3Rs (Reduce, Reuse, Recycle) motif with colorful yarn dyed bamboo rayon. 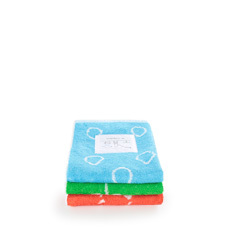 This 24cm square towel handkerchief fits easily in your bag or pocket and won’t get hot and sticky.